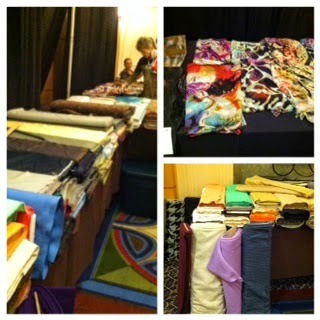 This weekend saw the arrival of the ETA Sewing Expo to the Rennaisance Hotel in Rutherford, NJ. (ETA stands for Education of the Textile Arts.) The expo was held on Friday, Saturday and Sunday, August 22, 23 and 24. Compared to other sewing expos (such as the one in Pallyup, WA and the one in Novi, Michigan), this one is tiny. There were only 12 instructors and the vendor hall consisted of one room. However, even though it was small, it carried quite a punch! The instructors were top notch. The vendor hall was packed with fun sewing items and there was quite a selection of fabric. There also was a fashion show on Saturday evening. This event was organized by the amazing Peggy Sagers who is also the owner and designer of Silhouette Patterns with Exclusive B, C and D cup sizing. No, those aren't buttons on that card that says Maude C. Those are a pair of cute earrings created by the fabulous Lauryn Bray. I put them on as soon as I purchased them. They coordinated perfectly with my crazy top - it was just meant to be! Check out her Etsy store. Lauryn is an inspirational young woman who taught the class, All in the Chicest Details, in which she spoke of what you can do to bring interest to your garments. She had quite a knack for mixing various fabrics, prints and textures and making them all work. She brought many garments she had made and it was great fun to be able to see these garments up close. My favorite was the jacket she is wearing in the photo below. I also took a class taught by Kathy Ruddy, One Pattern, Many Looks "Pants." (You can find her on Craftsy.com.) Kathy is an excellent teacher who was very informative and quite knowledgeable. She helped me think of pants fitting and design in a different way which I believe will be helpful when I decide to tackle pants again. Each student was given a quick pants assessment. You learn so much just by watching her analyze different body shapes. I then took a class by Carol Steinbrecher, The Wrap Dress, in which she spoke to us about the origins of this iconic dress, designed by Diane von Furstenberg in 1974, and how it is still popular today in many variations. Carol was a dynamic and energetic speaker whose enthusiasm was contagious. My last class of the day was taught by Lorraine Henry, Pants: Different Cuts for Different Curves. In this class, I gained a better understanding of why so many ready-to-wear pants don't fit (it has to do with the shape of the crotch curve and angle of the center back seam.) She demonstrated what a useful tool the 40" flexible ruler is in discovering your particular shape and how to use this information when working with a pattern. I of course purchased the flexible ruler and look forward to putting what I learned into practice. Saturday ended with a fashion show / challenge. Three contestants were sent a box of fabric. They had no idea what fabric to expect but they all received the same fabric. They had to create garments appropriate for 3 different scenarios. It was great fun to see the different interpretations and designs by each contestant showcasing each one's own sense of style. It was an absolutely wonderful day full of all things sewing and fashion. I am heartened to have learned that the ETA Expo will be back around the same time next year at the same location. There's nothing like being surrounded by like-minded sewists. Food for the soul. Recently, I finished making a nice lightweight color-blocked blouse for summer, Marfy 2155. I chose some cotton poplin I had in my stash. I initially was drawn to this pattern by the interesting twist-knot sleeves. I had seen a couple of reviews of this pattern on PatternReview: One by Re Becca and another by clothing engineer. Their versions were really cute. However, I thought the sleeves looked like short puffy cap sleeves that were not flattering on my arms. I also found that the sleeves felt uncomfortable since they restricted movement. Unfortunately, I did not have any extra fabric in my stash to cut out regular set-in sleeves. What to do? Luckily, I saw a sketch somewhere (sorry, don't remember where) of a 1930's dress that had sleeves split in the center of the sleeve. I decided to do the same and I am glad I did! The pattern sleeve as drafted comes in two parts. I simply sewed the sleeves down the center and stopped about 4 inches from the end. Instead of tying the two sections, I just let them hang. The bottom part of the armhole was finished with bias tape created from the navy fabric. The neckline "scoop" was drafted to show a little bit of cleavage but that is just not something I wanted to do so I raised it by 1 1/2 inches. I decided that putting a dark color, such as navy, on the sides panels would be slimming while putting the brighter color in the center draws the eye in instead of out to the sides. 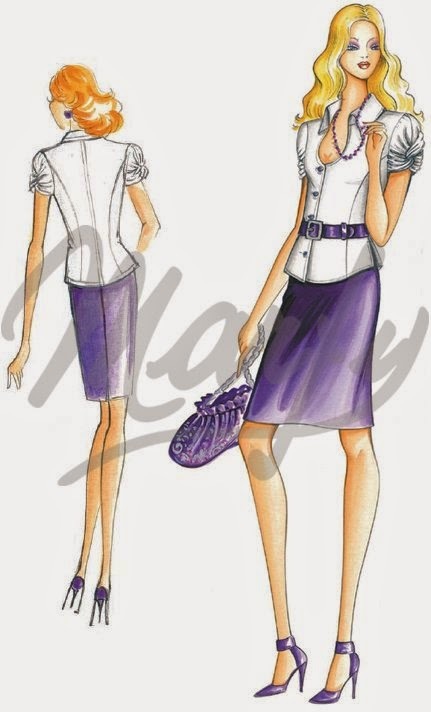 As you can see in the pattern sketch above, the pattern also had a stand up collar. To me, the blouse has a fun feminine vibe but I associate stand up collars with tailored blouses so I decided to omit the stand up collar. I ended up with a neckline resembling a horseshoe. I understitched all around the neckline but it was impossible to understitch by machine around the horseshoe shape. I therefore decided to do a pick stitch which worked rather well. The "horseshoe" lays flat on my chest and the facing does not slip out. The card they came on said they were enamel and 24K gold plated! Even though the card said they were machine washable, I decided I did not want to subject them to the washing machine or dry cleaners and I most definitely do not want to remove and re-sew them on. I decided to attach them with button pins. You can find button pins online at JoAnn's: Button Pins or at your local fabric store. When the time comes for me to wash this blouse, all I have to do is unpin the buttons! Yay! Since the fabric is lightweight, I did not want the serged seams to show on either side of the fabric. The way I resolved this was to sew with the lower looper in navy and the upper looper and needle in pink. I topstitched the hem but decided I did not want pink topstitching on the navy fabric nor navy on the pink fabric so I topstitched each section in its color. It was a pain to stop and change the threads but I do like the overall effect. As for fit alternations, I did a full bust adjustment, sloping shoulder adjustment and protruding shoulder adjustment. I think the blouse is a little odd with the horseshoe neckline and the unusual sleeves but it is one-of-a-kind and very comfortable! MPB day took place on Saturday, August 9th. It was my first MPB day and it won't be my last. It was just wonderful to spend a beautiful sunny day in New York City with like-minded sewers and bloggers. We all met at 11 am in front of the FIT museum where we started the day by viewing the current exhibit at FIT: Exposed: A History of Lingerie. To be honest, I did not focus too much on the exhibit. I ran into Kyle of Vacuuming the Lawn. I had first met her at a PatternReview event back in 2012. We sat on a bench in front of a Fortuny tea gown and caught up on the happenings of the past two years. It was great fun to spend some time with Kyle! Enrique is a car mechanic who loves to sew. He made the really cool carry-all you see in the photo and he has sewn some beautiful men's shirts. During the afternoon shopping excursion, Enrique was searching for the perfect soft drapey cotton fabric so that he and his girlfriend could make a dress for her together. He is teaching her how to sew! Ah….to be young and in love…..
After lunch, we all separated into smaller groups; some went to Mood (heard that Tim Gunn was there - bummer, I missed him! ); B&J; Paron and many other stores. Kyle and I went to Paron where there was a 40% off sale! Yippee! I purchased a beautiful emerald green Irish linen fabric. I have no idea what I will make with it and when but I just had to have it! Kyle got a gorgeous fabric in a beautiful shade of blue. We made a second trip later where she got another fabric that was dark blue with a small flower motif. (I think her favorite color is blue…what do you think?) I can't wait to see what she will make with these purchases! What is that old cliche?...Time flies when you are having fun…It certainly was the case here. Thank you Peter for organizing this beautiful day for us - you're the best! Why go through the trouble of making your own clothes when you can easily go to a store and buy them? This ready-to-wear blouse does not provide enough room across the chest. White ready-to-wear Elie Tahari blouse. Beautiful silk crepe de chine fabric sewn with French seams. Admittedly, I don’t have time to sew all of my clothes so I do purchase ready-to-wear. But I will make my own clothes whenever I can! Sewing is also a creative outlet that frees you from the constrictions of ready-to-wear or the dictates of the fashion industry. You don’t need to worry about making your body conform to the clothing. You make clothing that conforms to your body. You can pick the colors, silhouettes and design lines that are most flattering to you. You control the quality and cost of the garment.